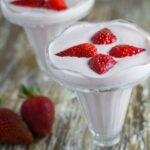 Today’s recipe is Dairy Free Strawberry & Banana Yoghurt and it is so tasty you’d never guess it was dairy free – or so quick and easy to make! Yoghurt has always been one of my go to snack options. Up until a few years ago, I would always have tubs of low fat fruit yoghurt in the fridge. Even after I found out I was lactose intolerant, I found that I was able to eat yoghurt (it has to do with how the bacteria in yoghurt kills off the lactose). While I was studying, I researched journal articles which detailed the full fat vs low fat debate, and found that full fat is the much better option – as the low fat varieties of most foods tend to have a lot more sugar and additives which compensate for the loss in flavour. I also learned that eating full fat from dairy and meat does not mean that you will get fat. When I started on my healthy eating and lifestyle journey, I swapped the low fat fruit yoghurt for greek full fat yoghurt and would add banana or nuts or granola with a small amount of honey – and that’s still a great option compared to most yoghurt products. These days, I don’t eat too much dairy at all, as there are links to a number of other potential health problems, so I decided to make a dairy free version and am really impressed with the taste, consistency and overall deliciousness. It is really easy to make and you can keep it in your fridge for a couple of days. I would suggest only making smallish batches at a time. So, if you are after a easy, go to snack, then you must try my Dairy Free Strawberry & Banana Yoghurt. Also, check out my Raspberry Vanilla Mug Cake, Easy Chocolate Mousse and Caramel Chia Pudding for more easy snack recipes. Place coconut cream can in the fridge overnight or a minimum 6 hours. Remove cream from the can and place in the blender, with strawberries, banana and maple syrup and blend for approximately 2 minutes on high until smooth. Place in the fridge to thicken, approximately 2 hours. You can store in the refrigerator for up to 3 days.